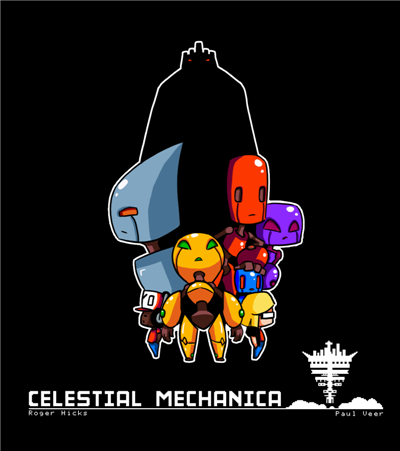 Celestial Mechanica (22.4mb ver1.20 made 2011 by Roger Hicks, no install .zip) is a fun, enjoyable and easy action platformer with some puzzle elements. Your typical run and jump type game with basic 8-bit style graphics but good gameplay, just think Metroid. On your quest you will meet characters that will help you but most that will not. You will need special abilities to help you along the way as well as switches that will need to be pressed to alter your path to progress. Be careful with some of the switches you have pressed as you may need to go back through the same part of the level to alter your path correctly. There's a bit of guessing involved here and some frustrating parts, with some "leaps of faith" thrown in for good measure. The games save system in very forgiving usually taking you back to the edge/start of each level screen but don't fear as you have unlimited lives. Watch the game video as it shows the game much better than what I can put in screenshots. A good game if you like your platformers, that's not too taxing on the brain, nice. The story so far... In the distant future after years of war and abuse caused by humanity, Earth could stand no more! The Earth began to break apart at it's core leaving humanity to die with all hopes of survival lost. Yet, within a second of Earth being shattered completely, a mysterious race of celestial beings appeared and earth's stability was miraculously restores! Humanity was forever in debt to the mysterious race and praised them as their saviors. 100 years later, the celestial beings continued to maintain the Earth's stability above the clouds in a fortress dubbed "Mechanica" by the humans. Little is known about Mechanica and the celestial beings who inhabit it. No Mechanian has been seen outside of Mechanica in 100 years, until now. This freeware game is available for Windows and Apple Mac and should play on low spec systems. Also this game uses flash projector, so it saves your game in your system's flash cache. Warning: if you clear your flash cache with a tool like CCleaner, it may delete your saved games!